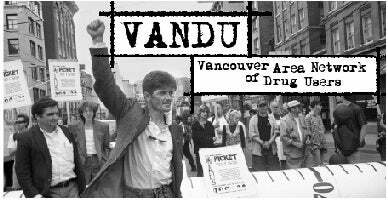 The grassroots organization VANDU (Vancouver Area Network of Drug Users), run by current and former injection drug users, has been attracting attention recently after receiving a cease and desist letter from Vancouver Coastal Health (VCH) demanding it close the doors of an unsanctioned, peer-run supervised injection site. According to VANDU President Hugh Lampkin, the site was created out of repurposed office room space in their Hastings Street location, and has been operating for nearly 4 years now. The site was intended as a "humanitarian response to an unmet need". There is certainly a growing need for the services, with approximately 40% of IV drug users sometimes requiring assistance in injecting their drug of choice. However, when it comes to actually pushing the plunger; this is a service that legally run sites are unable to provide. "For four years VANDU quietly offered a safe space, clean supplies, and the watchful eye and occasional assistance of a trained peer support worker (current and former drug users) for an estimated 50-100 injections a day". While the need for more sites is real, VCH Chief Medical Health Officer Dr. Patricia Daly explains that this type of underground site could pose a health risk and put a dent in efforts to obtain legal recognition for supervised safe infection sites. Daly stated that "VCH could not support an operation that was not run according to VCH best practices and that might put some clients at risk", and that it could possibly "jeopardize (VCH's) application with InSite (Vancouver's supervised injection facility in the Downtown Eastside) and the Dr. Peter Centre (a residential care and treatment facility for people with HIV/AIDS in the West End)"
"Peer-run models are seen as being unable to make it through the increasingly harsh exemption process, so local health authorities are forced to quash innovative, research-tested services in an environment of considerable unmet need". Many advocates of harm reduction strongly believe that implementing these life saving practices and initiates should not depend on legal approval. Regardless of this, at least for the time being, Vancouver Coastal Health disagrees, and therefore VANDU's doors will remain closed; continuing to leave the needs of injection drug users unmet.